The ladies at the front desk were just lovely. Great room. 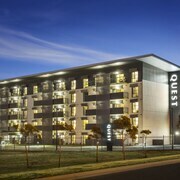 Hunting for somewhere to stay in Melbourne Airport? You're flush with choice! Whether you're keen to take bae on a romantic holiday or enjoy time out with your BFFs, you'll find the perfect room for your budget and style. 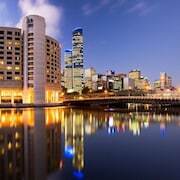 If you're keen to crash within 10 kilometres of Melbourne Airport's centre, you'll find 20 places that'll do the trick on lastminute.com.au. The PARKROYAL Melbourne Airport and Holiday Inn Melbourne Airport are a few of several pads that are near the vibin' city centre. Think about choosing one of the 6 available hotels in Brimbank, which is located 8 kilometres outside of the centre of town. Be quick! 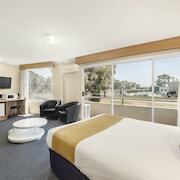 The Quality Hotel Taylors Lakes and Glengala Hotel are worth inspecting. Want more options? The AKOM Docklands is located 18 kilometres away from the downtown area, and the Crown Towers is 20 kilometres away. 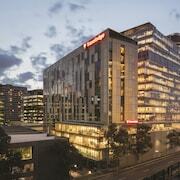 We'd also suggest the Park Hyatt Melbourne and the Grand Hyatt Melbourne. The first is 19 kilometres from downtown, while the second is 19 kilometres away. Always on the lookout for your next great adventure? You'll be happy to know that the wider Victoria region has some brilliant things to see and experience as well. Among Victoria's gorgeous natural wonders are its rivers. After you've gotten your zen on in nature, stop by history museums. Also, don't be shy to try your hand at some popular regional activities like snowboarding, skiing and mountain climbing. Still haven't uncovered your perfect room? You might just find a lavish enough thread count in Gisborne. You'll also be able to check out the Gisborne Peak Winery and Mount Macedon. 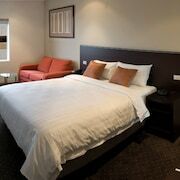 Some of our recommended Gisborne hotels and accommodations include the Gisborne Motel and Gisborne Peak Winery Cottages. 30 kilometres to the southeast of Melbourne Airport you'll also find Brighton East, which is home to the Caroline Serviced Apartments Brighton and Quest Brighton on the Bay. If you stay in Brighton East, be sure to visit the Monash Medical Centre Clayton and the Moorabbin Air Museum. Had enough of aeroplane food? Longing for a bit of privacy? 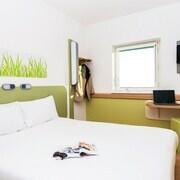 Then you'd be mad not to snag a room at the Ciloms Airport Lodge or the ibis budget Melbourne Airport. 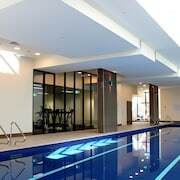 They're both super close to Tullamarine Airport, 1 kilometre from the centre of Melbourne Airport.